WHAT IS THE YOUPIC’EM FOOTBALL FUNDRAISER? YouPic’Em Football is a fundraising game that pays cash prizes to your supporters! Your organization will profit by selling tickets. Each YouPic’Em Football ticket has a unique access code that allows your supporters to play the YouPic’Em Football game online! Players pick 4 NFL football teams they believe will score the most or least number of points each week. Cash prizes are awarded weekly to the players’ teams that have the highest and lowest scores! Players can view their picks and track how their teams are doing at any time. The fun part is, players get to pick their teams weekly and change them! YouPic’Em Football game follows the last 10 weeks of the Pro football schedule. Tickets are available to sell up until one week prior to the first game of that week. We base this fundraiser on when you need to raise money! We suggest selling your tickets for at least 2 months prior to your game starting. The winners of YouPic’Em Football game are posted online along with their selected teams and points scored each week. Green Bee Fundraising will take care of running this game for you online, posting all winners and paying the winners their prizes. All your organization has to do is sell your tickets! Your profit is based on the number of tickets you sell in person and through social media. Tickets are sold for $10 each. 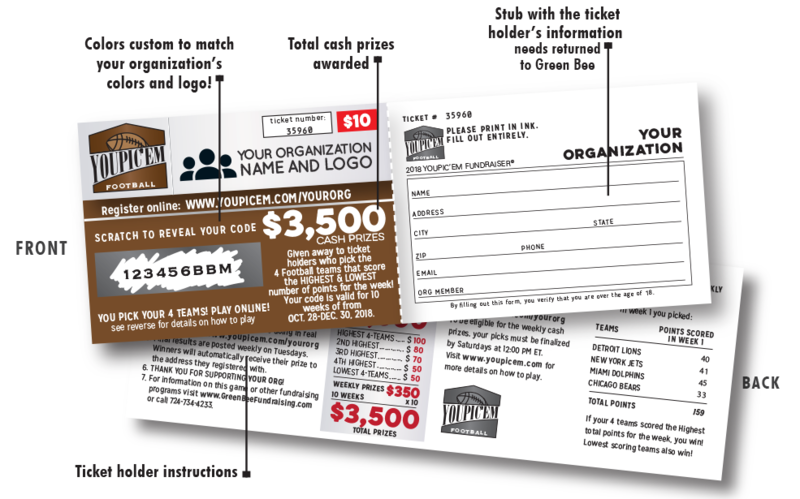 You will first pay your prizes, which are customized for your organization. Your profit is 65% after you pay out prizes. Your prize money will be raised through the sales of your YouPic’Em Football tickets. 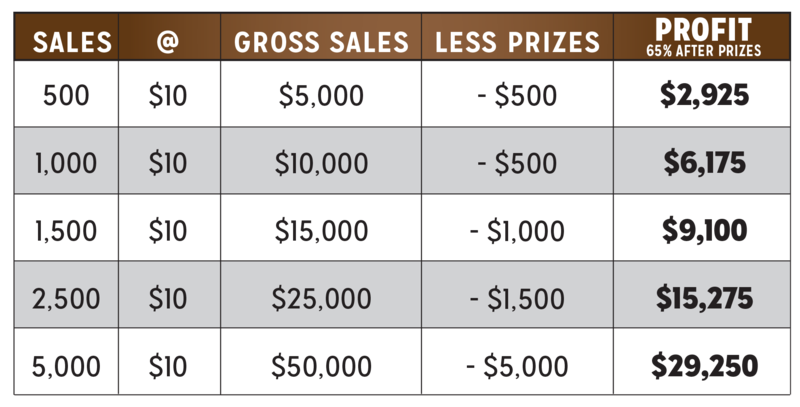 The profit chart below shows examples of sale quantities with suggested prizes. You will pay a minimal print fee for your custom tickets. Call us to find out more!